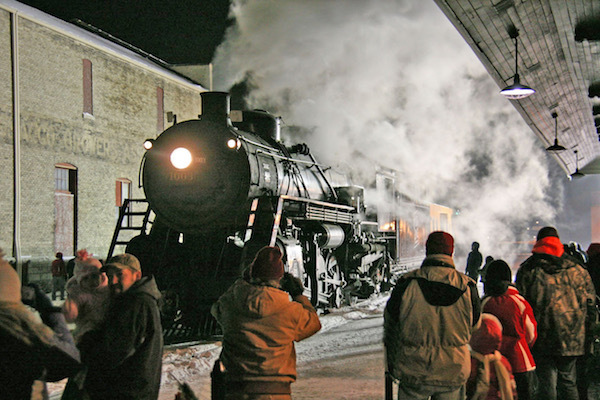 Three Events to see Santa and Steam Locomotive 1003 During This Holiday Season!! November 10, 2018 – Santa and 1003 will be in downtown Hartford, WI from 11:30 AM to 2:30 PM. 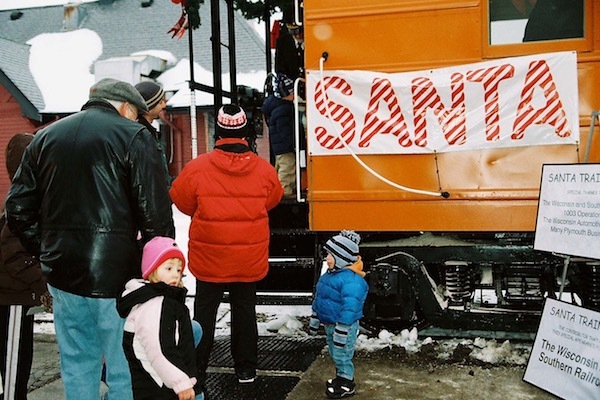 Kids and parents may visit Santa in his old caboose in this “no charge” event. The festive Hartford Christmas parade begins at 3:00 PM. November 23, 2018 – Plymouth, WI will host Santa and the Santa train with 1003 at the city park from 11:00 AM to 3:00 PM, also with no charge . As a special photo opportunity, the engine may also be viewed on the Mill St. bridge in Plymouth in conjunction with their Parade (7:00 PM). November 23, 2018 – Elkhart Lake, WI will have their traditional tree lighting and downtown holiday activities between 4:00 PM and 6:00 PM. 1003 will be present at the dedication of the recently restored Soo Line caboose which is on permanent display at Elkhart Lake. This caboose may be visited. Santa will be outside and be a part of the activities. There are no “in-caboose” Santa Claus visits at this location. 1003 will also deliver previously purchased Christmas trees while downtown. For purchase information call 920-876-2122.